An ancient ritualistic form of worship, the folk art Theyyam is a blend of dance, music and fervent devotion. Fiery colours, awe inspiring headgears, costumes and face designs, the rhythm of the chenda, the intense fragrance of the burning camphor and intense passion all combine to offer you an experience worth a lifetime. Dear Friend, Ever watched days and nights get enlivened with fiery red performances? It is time to explore the world of Theyyam, a ritual art form performed mainly in the temples of North Kerala. The high-spirited performance of the artistes wearing elaborate makeup and exquisitely decorated costumes and headgears dancing to the exuberant notes of the percussion music makes for a resplendent sight. 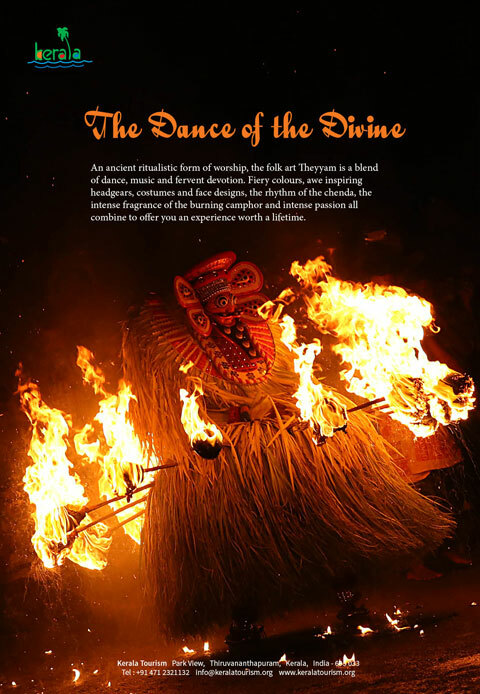 Enjoy the videos of these spectacular performances and surrender to the mystic charm of Theyyam. Phone: +91 471 2321132, Fax: +91 471 2322279, E-mail: info@keralatourism.org, deptour@keralatourism.org.